Group Lessons, Elementary, Middle and High School: Note Schedule Change! Please note the date and time change! Our Guild assignment is one week earlier than usual, so we are changing our last group lesson to May 28. This is Spring Recital Week. Private lessons as scheduled--please note that these will be the last private lessons of the quarter. Next week will be National Guild and last Group Lessons. National Guild Auditions, MAY 30! All students are playing at the National Level--this means 7 memorized pieces and 3 technical phases, 10 items all together. This is quite an accomplishment! Please let me know if you are interested. Summer lessons will be offered on an a la carte basis. The theme for this year’s summer camp is: Making Music with Friends—Ensembles! We will be featuring 2 newly composed piano trios (including violin, cello, trumpet and clarinet), 4-hands, 6-hands and 8-hand pieces, and possibly much more! Snacks and art projects included. 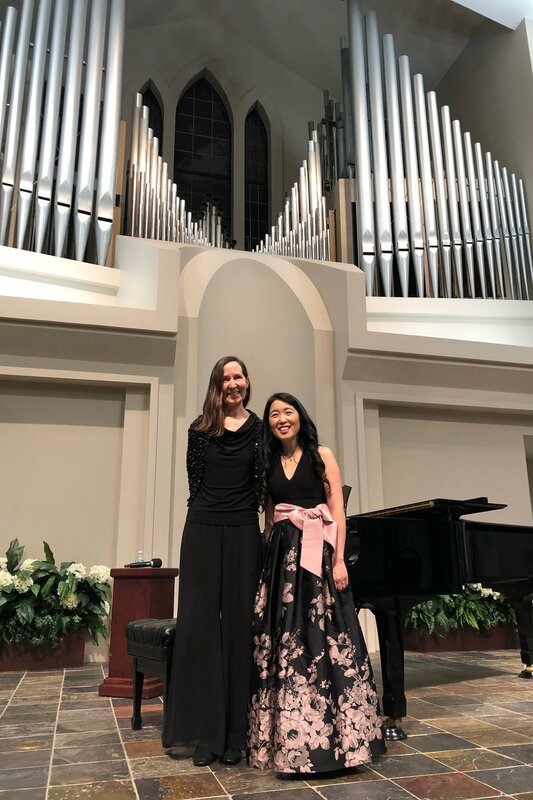 Winners chosen by the Music Artistry Program (MAP) Visiting Artists are showcased in three afternoon recitals. M.A.P. at SMU on March 12! Update: We have received our M.A.P. schedule! Tuesday, March 12, from 8:30-2:15. Each student will have a 10-30 minute time slot with the Visiting Artist, depending on their level. The V.A. this year is Jee Wong! Please note, our times are all scheduled during school hours. If you would like an informational form regarding the absence for the school, please let me know. Students perform 2 pieces for the Visiting Artist, who gives constructive feedback. Please dress appropriately for MAP (ie. dress, nice slacks, etc). Winners will be chosen to perform at a MAP Honors Recital on 3/17 (Sunday). Group Lesson! Please note: Group class is on MONDAY this week, as we need to work around our MAP schedule assignment. Our MAP is the next day, Tuesday, March 12! WSMTA State-wide competition. Up to 2 students will represent our district at the State Conference in June. Ramona and Holly in Home Recital, March 1st! Featuring all French composers, Ramona and Holly Reeves will perform at the Allen Residence a musical soiree! Olympia Chamber Orchestra Concert, featuring Lilia & Chloe! Come and see the 2018 Concerto Competition winners perform with the OCO, our very own Lilia and Chloe! As 1st prize winners of the Advanced A and Advanced B divisions, they win the prize of playing with this orchestra. Come enjoy an evening soiree of all French composers for cello and piano! From early Baroque works to late Romantics, Ramona & Holly Reeves will be the performers at this Feb 23, 2019, concert series in Chehalis. Free admission. Over 200 young musicians celebrate the music of Frederic Chopin! In celebration of the founding of the Governor’s Mansion Chamber Series, two of the founders will be playing, along with Ramona and other guest artists. All are welcome! Tickets are by reservation only, due to security at the Mansion. Lessons only on 12/17-18 (Mon/Tues) & 1/3 (Thurs). Winter Recital at Olympics West Retirement Center! (929 Trosper Rd in Tumwater). Please come prepared to share a piece with your piano group! This is a state-wide competition, taking place at CWU. Deadline for application is 9/12/18. Friday, November 9, 2018, 7-8pm. This is a dress rehearsal for all students participating in the annual OMTA Concerto Competition on Nov. 17, but open to everyone to come and listen and support! Please come prepared to share a piece with your piano group! We will also have some music theory games, composer stories and snacks! Please pick up your student promptly at the end of class for smooth transitions. Thank you! This group lesson is for students age Kindergarten to 3rd grade. Friday, 3:45-4:30. Please pick up your student promptly at 4:30, thank you! Come prepared to share a piece with your piano group! We will also have some music theory games, composer stories and snacks! Outstanding Artist Competition is a state-wide competition. Regular lessons every week, unless noted in the calendar. Spring Quarter Ends June 8! Summer lessons start June 11! Spring Quarter for piano ends June 8. If you would like extra lessons during the summer starting June 11, please contact me, and we can scheduling them. They will be offered on an a la carte basis, due to crazy summer schedules! Summer Session: available dates listed under "News"!